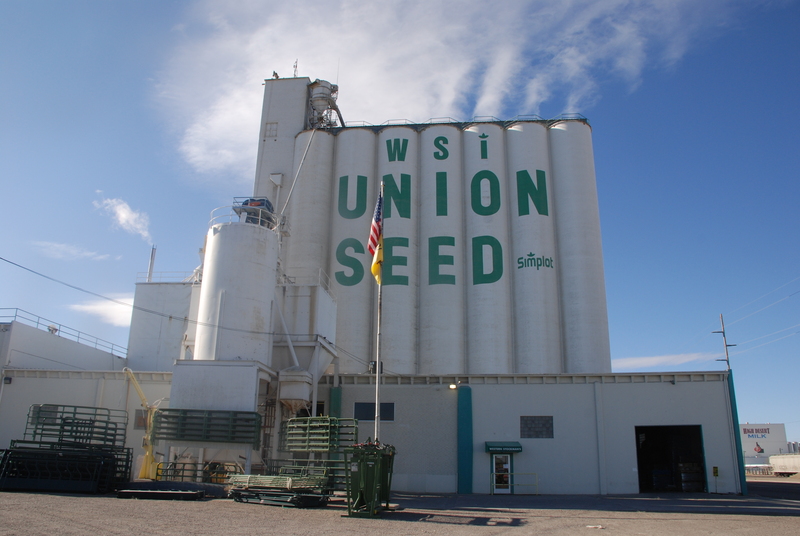 This entry was posted in Mayer-Osborn, Their Work and tagged architecture, Burley Idaho, Construction and Maintenance, grain elevators, Leland Ulrich, Lou Dilley, Mayer-Osborn Company, seed production, WSI Union seed. First of all, let me explain how an elevator actually works. The grain is dumped from a truck through the grates. The area below the grate is called the pit. The leg runs from the pit to the head house. On the leg is a thick rubber belt with buckets or cups. When the leg is started, the belt will move through the pit. The cups will fill up the grain and take it to the head house. As the leg reaches the top, it will arch, the cups will be up side down. When the cups turn to go back down towards the pit, they empty the grain on a conveyor belt. The cups will be facing downward, until the cups reach the pit and the will right themselves, filling up with more grain. The run is the conveyor belt between the elevator and a storage annex. The run will have walls on the side of conveyor. They could be completely covered, too. Workers will set up the run, to a certain bin. There are openings at each bin. There is generally a door that they can open, so the grain will fall into the bin. They will put another piece of metal on the run, which acts like a chute. Thus, when the grain gets to the proper bin, and the grain hits the chute, the grain will move toward the opening of the run, and the grain will empty into the bin. Sometimes, there will be a short conveyor belt that can be put under the main conveyor belt from the elevator. It is the same method. The grain will hit the chute, then through the opening, onto the second conveyor belt, which has a rise to it, and it will dump the grain into the bin. Kristen mentioned that the bins are sloped. Most bins are built this way. You can think of it as self cleaning, as all the grain will come out the bottom of the bin. Now, if they built the bin flat, most of the grain can be removed. However there will still be about three feet of grain that is away from the bottom opening. Then some one has to climb through the manhole into the bin and they must shove the grain through the opening at the bottom. This is the only way that you can empty a flat bin. The storage annex always has a basement. There is a conveyor belt that runs from a bin, back to the elevator, then up into a hopper. Most elevators have two separate hoppers. One will load a rail car and the other one can load a truck. If you did not have this conveyor belt, you could not unload a bin. The area where the run is located is enclosed. 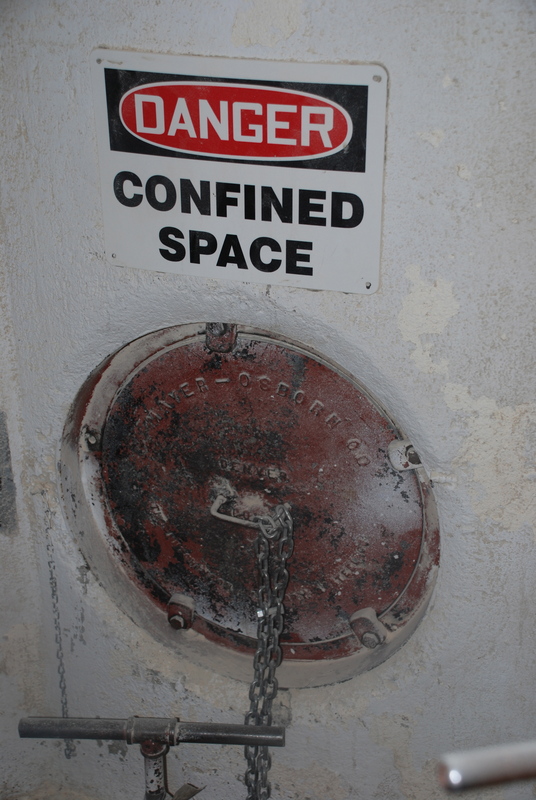 If you look at a photo of a grain elevator with a storage annex, you will see an enclosed area above the storage annex. Outside this area, the bins are covered with concrete. Inside the run, either part of each bin will be open, or they could have metal slabs that cover the bins.